What’s the Project? These fun Halloween drinks for kids are super simple to pull off but make a fun addition to any Halloween party. Choose your punch or soda and add a cute face to it and you’ve got a fun drink idea for the big day! Halloween is one of my favorite times of year to throw a party. 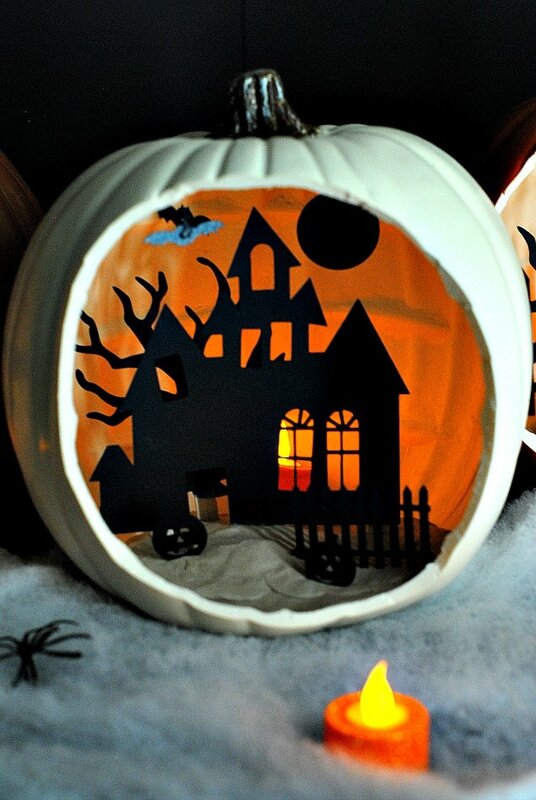 There’s just something so fun and exciting about a Halloween party. Maybe it’s the costumes, maybe it’s the treats, maybe it’s just that magical feeling in the air during October. Whatever it is, I think Halloween parties are fun and I think this Halloween drink for kids is going to make a great addition to your next party! 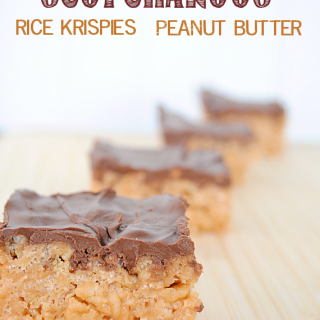 This is a very sweet and simple project. 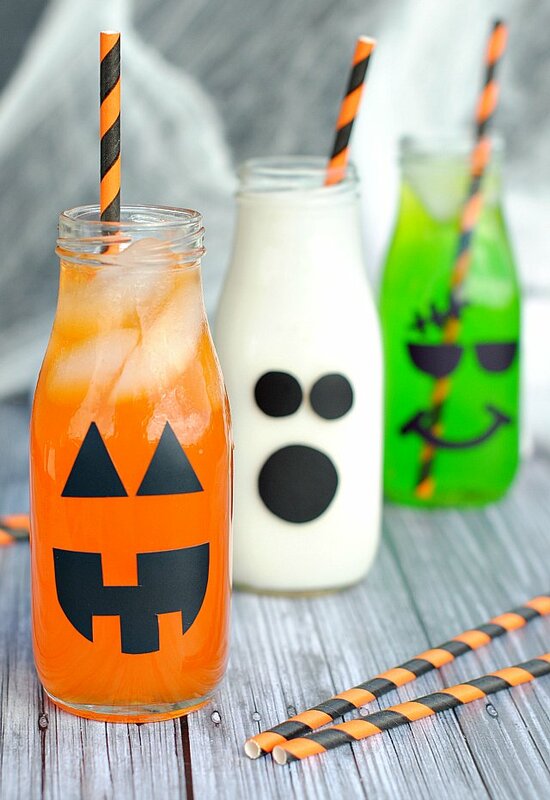 It’s just a very easy and cute way to do drinks for kids at their Halloween party! They will love it and you will feel great because it was so easy! 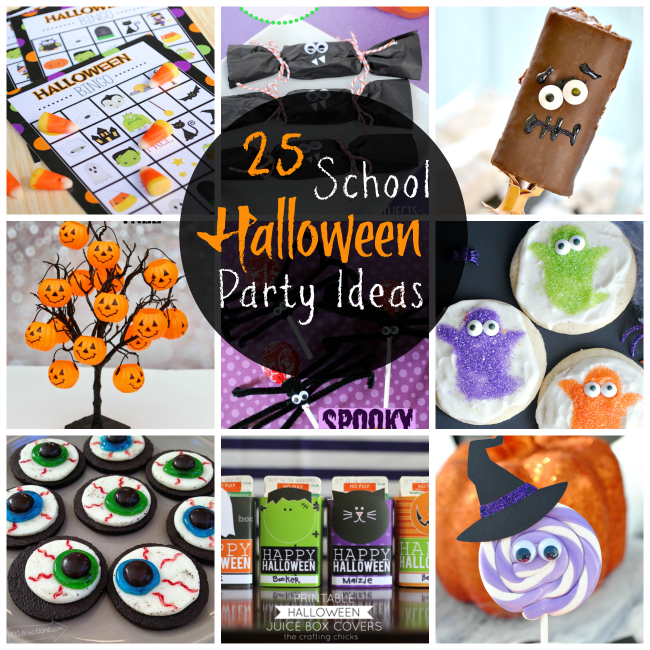 Perfect for Halloween parties or just to do for your kids at a fun Halloween dinner. Cute right? Just fun little faces on drinks. I used milk bottles here mostly because I think they are adorable and I’m always looking for any excuse to use them, but you can also just use clear plastic disposable cups and do the same thing. Drinks of your choice-Orange soda works well or green juice or Gatorade. Also, milk works great! Cut faces from your black vinyl. I just free handed some simple ideas. For the Jack o’ Lantern I used two triangles and a mouth. If you need a template, here’s a good one. You can just print and use that as a guide. For the ghost simply cut three circles with one slightly bigger than the other two for the mouth. For Frankenstein, cut two half circles for the eyes and then I free handed a mouth and the little stitches on his forehead. Peel and stick the vinyl to the jars or cups and fill them with the drinks! If you’re using cardstock just stick it on with glue. I used Orange Crush for the Jack-o-Lanterns, green Gatorade for Frankenstein and white milk for the ghost. What other fun ones could you do? Like I said, so simple, but fun right? I hope these Halloween kid’s drinks are just the thing for you this year!